The Mikki Soft Pin Slicker has specially shaped slicker pins which are mounted on an air cushion to enhance grooming action & reduce any excessive brushing force. It's curved back, ergonomic handle and flexi-head ensure a natural grooming action, enabling the medium length stainless steel pins to work effectively. The pins are designed to be used with a soft stroking action, enabling the shaped stainless steel pins to ease tangles & matts and remove loose/dead hair from the undercoat, leaving the main coat clean & healthy. 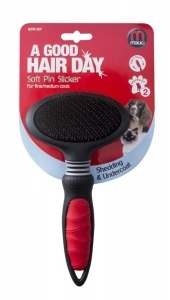 Ideal for medium and long coated dogs. Regular grooming will help give your pet a shiny, healthy looking coat.